The professional plancha originated in southern France and the Basque Country. It is increasingly popular in the restaurant business since it allows fast and healthy cooking. But what about care and maintenance? Even though planchas require very little fat, they can be tricky to clean. One must take into account materials, since every type of plancha requires specific care and maintenance. Proper care of this piece of equipment is crucial to maintain its cooking efficiency, as a dirty plancha can alter the taste of food. 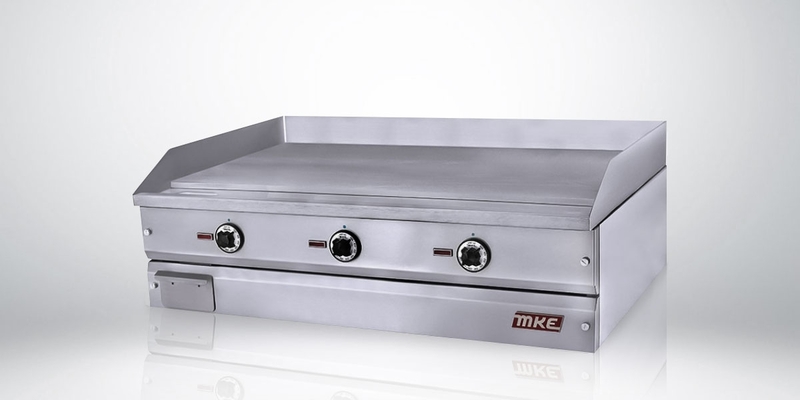 The following tips will help you properly care for your professional plancha. Deglazing is a cleansing process that consists of creating a thermal shock on hard chrome planchas. This method is not suitable for stainless steel, aluminum or glass ceramic planchas. Unplug or turn off the plancha. Pour ice cubes or very cold water on the hot plancha to loosen food particles. Use a spatula to scrape remaining food particles. Wipe clean with a clean paper towel. When deglazing is not an option, try the cold cleaning method. Unplug or turn off the plancha and pour dish soap or cold water over it. Use a plastic spatula to scrape remaining food particles. Scrub the plancha with a damp cloth once it has dried. You can also use baking soda on a wet plancha. Use professional cleaning products with care, they can cause damage to the plancha. Beware of vinegar and oven cleaners, they can alter the taste of food. Avoid steel wool or metallic sponges that could cause scratches. Add a thin coat of cooking oil to protect you plancha and help during cooking. Use a pumice stone or rolled steel on stubborn residue. Your professional plancha should last a lifetime and keep its appearance if you follow these tips. Don’t hesitate to contact us for more information, we will gladly answer all your questions.